Update 2016: having now been through several pairs of these shoes, it’s important to note that they’ll probably only last you a few hundred miles. For more, read Are trail shoes durable enough? A review of Merrell’s All Out Peak trail shoes, from the perspective of a walker and backpacker (I am no runner!). About a year ago, I made the transition to lightweight, breathable trail-running shoes for the majority of my hiking and backpacking. 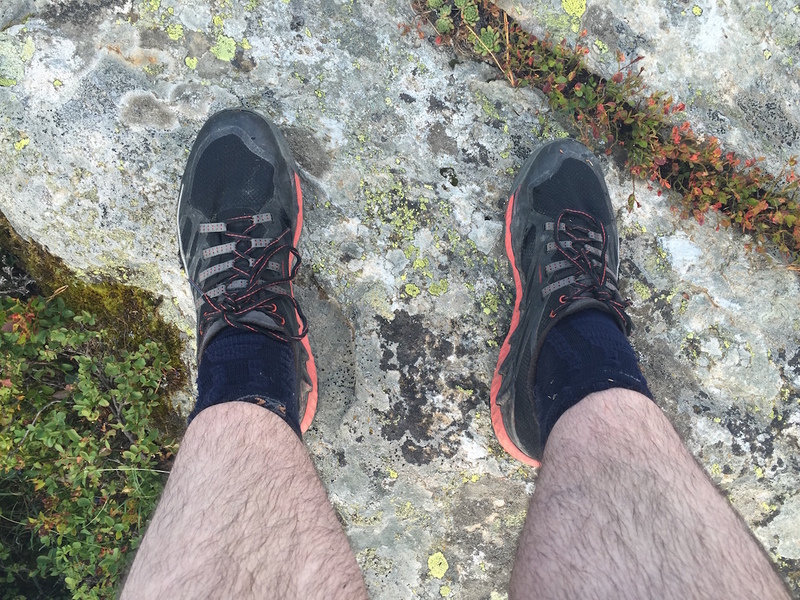 My initial shoe of choice was the Inov-8 Roclite 295 — comfortable and great to wear on the hill, but durability wasn’t up to standard and the sole cushioning collapsed about 150 miles in to the Cape Wrath Trail, leading to sore feet. At about the same time, the soles began to part company from the uppers. When I got to Ullapool it was time to look for new shoes. The soles must be grippy and suitable for rough ground. Only high-spec, off-road running shoes fulfil all of these criteria and the shop I visited only had a single pair of shoes that would suffice. They were the All Out Peaks. I had to buy shoes half a size too big for me, as they didn’t have my normal size in stock, but they would have to do. The shoes have more cushioning underfoot than the Roclites, and the walking experience is therefore quite different. The toe box is wider and the mesh is finer, but the uppers are far more reinforced than the Roclites, with a cradle of rubber or plastic material to protect the mesh and provide structure. The biggest difference is the unusual lacing system. Merrell call this ‘Hyperwrap’ and claim it ‘locks the foot in place to enhance natural stability and agility’. The laces don’t meet the shoe at static eyelets, but are attached to a cradle of movable webbing straps beneath the laces. It’s hard to explain but it feels like you’re tightening two discrete systems when you pull on the laces, not just the laces themselves. I found this strange at first and wasn’t sure I’d get on with it, but it grew on me and I think it gives more precise control over fit. If you’re considering these shoes I’d advise you try them on in a shop first. I first used the All Out Peaks for the section of the CWT between Ullapool and Shenavall Bothy. It’s a varied section of trail including some good paths but a lot of the usual heather-bashing and bog that the CWT is notorious for. I actually wasn’t too impressed with the All Out Peaks for the first few miles. I kept fiddling with the weird laces to get them just right, I was having doubts the larger size would work out, and the extra cushioning felt strange after the minimal feeling of the Roclites. But I soon began to appreciate the improvements. The sole unit is much grippier, the finer mesh keeps out more of the silt and debris from bog water, and the extra cushioning makes a huge difference to comfort. I could really feel the difference at the end of a long day on the trail. And, although I haven’t done any scientific tests, I think these shoes dry more quickly than the Roclites, too. The only real disappointment is that splits began to appear in the mesh after only about fifty miles, at the main area of flex just behind the toes. At first I was concerned that the shoes would fall to pieces on me, but I soon realised that the damage was only superficial and that the reinforcement surrounding the uppers would prevent the kind of deterioration I had seen on the Roclites. There’s also a chance that getting a slightly larger size was partly to blame for this flexing damage. As soon as this occurred to me, I put an extra pair of insoles into the shoes to act as volume reducers. 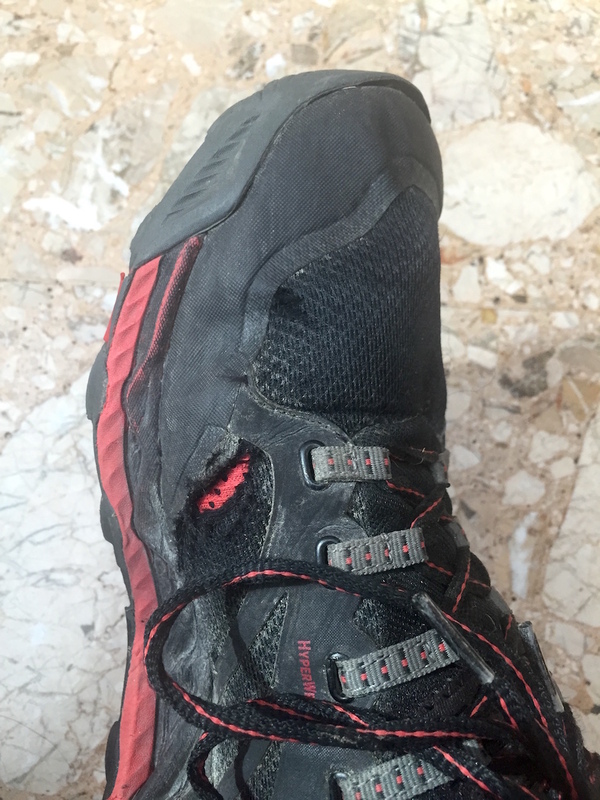 I have now worn these shoes for about two hundred miles of hiking, including the Tour of Monte Rosa in the Alps. The TMR featured completely different terrain to the CWT: much drier and better paths, but also far rockier and steeper ground with some snow and ice. My opinion of the All Out Peaks at the end of the CWT was more or less ambivalent, but by the time I completed the TMR I really loved these shoes. I’d long since figured out the best way of lacing them, and the best insole combination to use. The almost ridiculous level of comfort was a huge benefit to me. They have never given me blisters, an accolade they share with the Roclites; but, unlike the Roclites, they’ve never even given me sore feet, no matter how hard I push myself. The rugged Vibram soles can cope with any terrain the mountains can throw at a backpacker: mud, vertical grass, scree, hard-packed snow, even easy rock climbing. The splits in the sides of the shoes have increased in size, but there is no sign of damage to the reinforced areas and I’m satisfied this is merely cosmetic. Otherwise the shoes are holding up extremely well, with minimal wear to the soles or uppers. I’m confident they have another couple of hundred miles of life left in them yet. If they fit you, the Merrell All Out Peaks are great for backpacking. 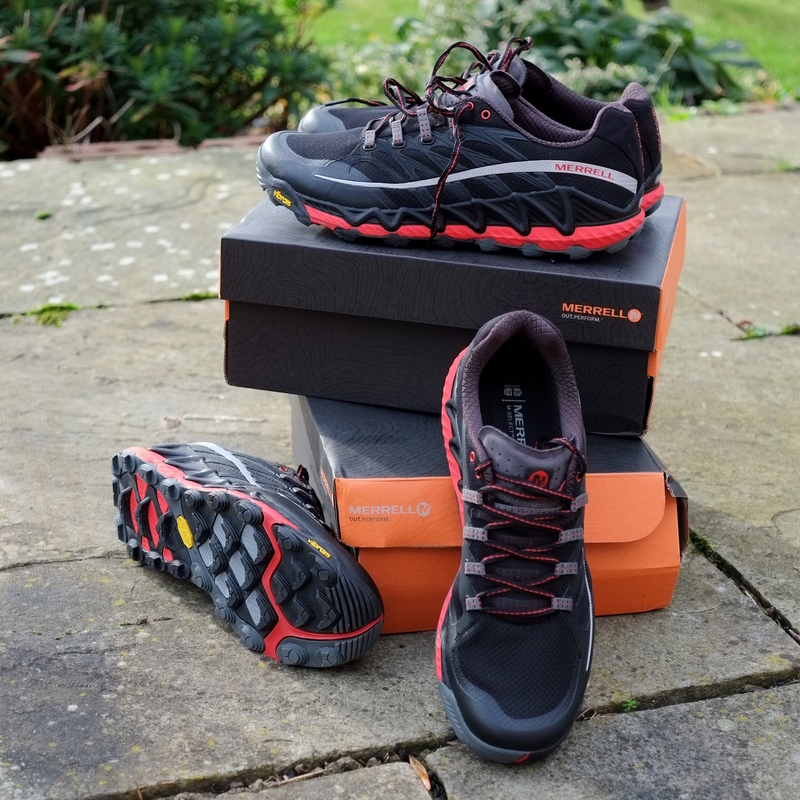 They’re comfortable, rugged, quick-drying, and have unrivalled security on any terrain. But their quirks may put off some people, especially the weird lacing system. At full price these are expensive shoes, too. I like the All Out Peaks so much I bought two new pairs (at a discount) to keep in reserve. That should keep me going for a while! Disclaimer: I purchased these shoes with my own funds and have no relationship with the manufacturer.